I will be returning to Mendel Glacier in September with a party organized by HistoryFlight. More news will be posted here as details are known. We will be searching for the remains of William Gamber and John Mortenson. This trip has been sanctioned by Sequoia & Kings Canyon National Park. A ranger from the NPS will be on site at all times. Any remains that are discovered will be marked by GPS and will not be disturbed. This is a search and discovery trip, not a recovery operation. Here are some comments I've received from readers. "Great reading!!! 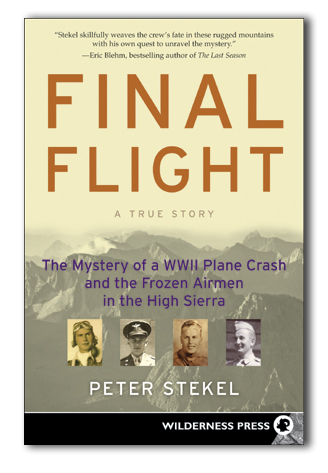 I learned to fly at KBIH in the mid fifties and have flown across the Sierras countless times." - Bob C., Santa Cruz, CA. "I appreciated the way you made it easy to understand the effects that adverse weather may have had on the Final Flight." - Dan M., Walla Walla, WA. "I just finished Final Flight. In fact I read it twice because I was fascinated by all the things that were not true that you had to uncover." - Paul L., Fayetteview, PA.
"I read Final Flight about a year ago. Enjoyed it so much I gave my father a copy. His interest in aviation and its history has rubbed off on me." - Jakob P., Norway. "I was impressed by the level of research you did to get to the bottom of the missing and conflicting details. Also, it must have been an amazing experience connecting with the families. I certainly learned a lot about the aircraft, weather, and Kings Canyon along the way." - David F., Seattle, WA. "What a privilege to listen to a literate honest adventurer who's loves both entertain and inform us." - Audrey K., El Dorado, CA. "I got a stack of books for Christmas. I picked up Final Flight recently. I did not put IT DOWN until I finished it. Stekel is an incredible researcher. I am now sharing it with an ex-Army light surgeon in Wichita. Thank you." - Maj. Swallow, Anchorage, AK. "I just listened to the podcast of your talk at the Seattle Public library and plan to buy the book. Your story about how you fell in love with the Sierra Nevada struck a chord with me: I had a similar experience in 1981 when I was 16 or so, on a school-sponsored a backpacking trip. I still remember the impression the mountains made on me, AND I made a historical discovery in those mountains, though it wasn't as cool or important as yours." - Charles W., San Diego CA. "I just finished reading your book Final Flight." I enjoyed it immensely - it was very hard to put down. Since I was in the Air Force (1966-1970) and thoroughly enjoy flying (not a pilot though). This was a very interesting book. Thank you for a job well done!" - David D. Neskowin, OR. "What a terrific story. Thoroughly researched and told with sensitivity to the airmen and families involved. You can be proud your work." - J. Doyle. "First off, both your talk and book are fascinating. I stayed up until 1:00 AM last night reading the sections on the pilot, aircraft, and your scenarios for the crash. Your research and information is unbelievably accurate and brings back lots of memories of the time." - Frank D. Ridgecrest, CA. "I especially enjoyed your book's presentation at the Newport Beach Library on April 7, 2011, on the loss of the 4 men in the USAAF Beach 18, AT-7, on Nov. 18,1942, on the mountain glacier in Kings Canyon National Park, CA (a place familiar to me),......followed by my reading your book, and your personal interest and research (including the earlier misinformation) that led to your personally finding remains of the AT-7 in August 2007, including the remains of the 2nd man (2 men still missing). Well Done! Or as we in the military say, Bravo Zulu." - Don T. Captain, USCG, Retired Newport, CA. "Thank you for that event and autographing my copy of your book. I cannot hardly put it down, which in layman's terms is a grand compliment. You have a very good handle on keeping the readers interest via fine writing style." - David, L. Newport, CA. "I just read your book, Final Flight, which I enjoyed. That must have required a tremendous amount of research and to have discovered one of the missing crew. Wow! - Rob V. Bothell, WA. "I very much enjoyed Final Flight. I would have finished reading in one sitting but I fell asleep so it took two days. I'm a former Navy pilot and many elements in that story stir memories from 40 plus years ago--from student pilot days onward." - Bill F. Seattle, WA. "Just finished Final Flight. I thought it was a great read. I really enjoyed it and learned a lot from it. And I am amazed at the extent and depth of your investigative work. I hope you're now working on another book. If so, please let me know when it becomes available." - Arnie S. Davis, CA. "I finished Final Flight and loved it. I like how you keep to the main thread, but follow the little ones to give enough information to make the main one more interesting. The figures about war dead for different countries in WW2 and the proportion of accidental v. combat were new to me." - John T. Berkeley, CA. "I've just finished the first four chapters and enjoyed it thoroughly. It reads well, lively like a novel, and unfortunately I'll probably finish it by tomorrow. I know the book has a lot of detective work behind it and it has had a long gestation, and it seems a shame to finish it so quickly." - Hill P. Los Angeles, CA.